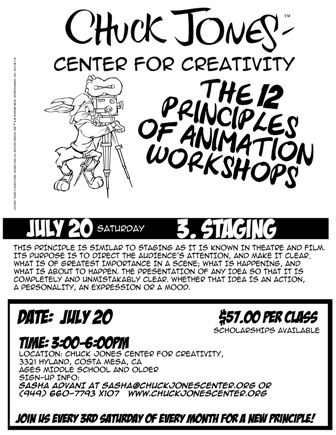 12 Principles of Animation Workshop this Saturday, August 17! There are two different approaches to animating a scene. "Straight Ahead Action" means drawing out a scene frame by frame from start to finish. While "Pose to Pose" involves starting with drawing the key frames, and then filling in the inbetween drawings later. John Ramirez, animator artist for Disney movies such as “Beauty and the Beast”, “Aladdin” and “The Lion King”. All classes will be held at the Chuck Jones Center for Creativity. This principle is similar to staging as it is know in the theatre and film. Its purpose is to direct the audience's attention, and make it clear. What is of greatest importance in a scene; what is happening, and what is about to happen. The presentation of any idea so that it is completely and unmistakably clear. Whether that idea is an action, a personality, an expression or a mood. Sorry folks! Drop In and Draw has been canceled due to a special event.Check back with us next week!